Please find attached our 'Family' Turning Twenty quilt. My next project will be a Turning Twenty for my husband who is in the UK military and is going to be living away from home with his next job. At least with a quilt made for him he will be a little closer to home! I am living in the USA for a year and joined an International Wives Club to make a friendship quilt. I told my 3 daughters what I was doing, so was asked who is the quilt for. I choose to make another quilt at the same time and my instructor suggested a 'Turning Twenty' quilt from your book. I went with my family to a fabric shop and explained what I was making and that I wanted it to be very 'patchwork/random'. The shop assisstant suggested that rather than me picking the fabric we each picked 4 fat quarters. My 2, 5 and 7 year old girls and my husband and I did that. When piecing the quilt I put the fabric in paper bags and sewed at 'random' whatever arrived in my hand. 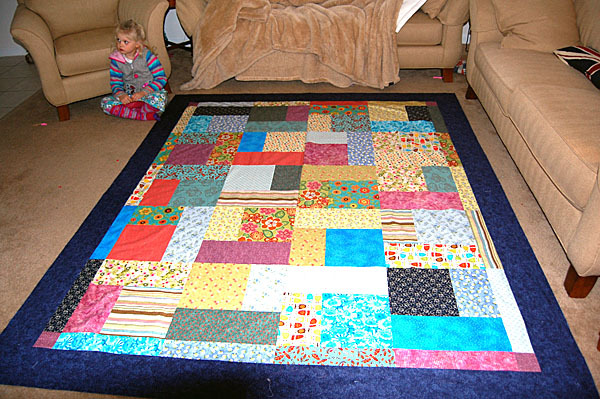 I am so thrilled with my 'Family quilt' that I am now hooked on fabric and quilting. I would love to show you this beautiful quilt.